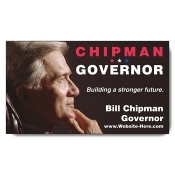 Custom campaign and election refrigerator magnets are an ideal promotional tool for marketers. Start your campaign by giving these effective customized magnets printed with your election symbol, name and contact details. 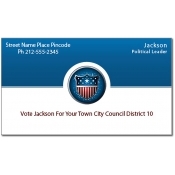 Ideal for any type of campaign, these promotional magnets allow you to connect with your target audience easily. 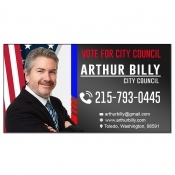 For best benefits, distribute colorful business card magnets announcing your candidature and contact information during mass events. 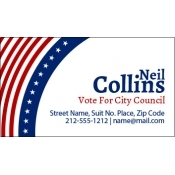 It is definite that your well-wishers would love to retain these election business card magnets over their fridge doors or work cabinets. 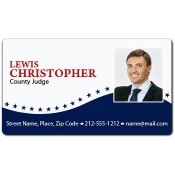 They will easily make your campaign a talking point by pointing at the customized magnets to their family and friends who enter their kitchens. In addition, regular viewing will encourage them to check the credentials of a candidate, their achievements and political history before casting their votes. For best benefits, campaigners can combine these custom magnets with some of the other election magnets in this category such as election car magnets, campaign car magnetic signs, political campaign magnets, etc. 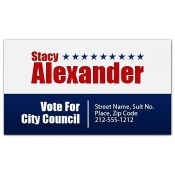 Campaigners can get election magnets printed with any color of their choice because we offer free full-color printing. They can highlight their main information in bold and visually appealing colors without worrying about the set up charges. These customized magnets are also perfect for non-office figures which are trying to build their popularity. During these testing times, many public- safety departments are trying to cut down their marketing investments. They can easily raise awareness through these campaign fridge magnets. 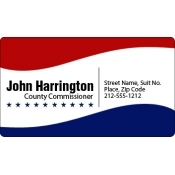 Campaign business card magnets are perfect for distribution during tradeshows, political rallies, community conventions, etc. Built on lightweight material, campaigners can consider it for mailers, at least some months before their election. To know more about designing, shipping and more about these campaign promotional magnets, feel free to contact us at 855-762-4638 (Toll Free) or write to us at info@CMagnets.com.